Where did service members killed in Iraq come from? Below is a map of the home cities of US service members killed in Iraq. 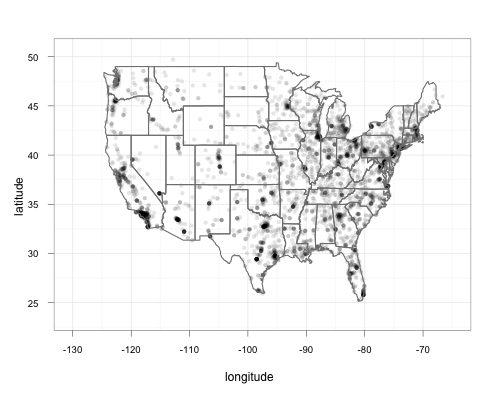 Thanks to Adam Ozimek's Stata geocoder and Hadley Wickham's ggplot2 package for R, this took a grand total of 14 lines of code. I suppose the biggest attention-getter to me was the density around the Great Lakes region. The high densities in California, Texas, and New York were not particularly surprising. Possible updates may include per-capita figures. I will definitely want to see how these accumulated across time, and the ultimate plan is to connect them with public opinion data to see if there is an apparent effect. Other suggestions, questions, or criticisms are welcome. Is there anything you notice in the graph that I missed?